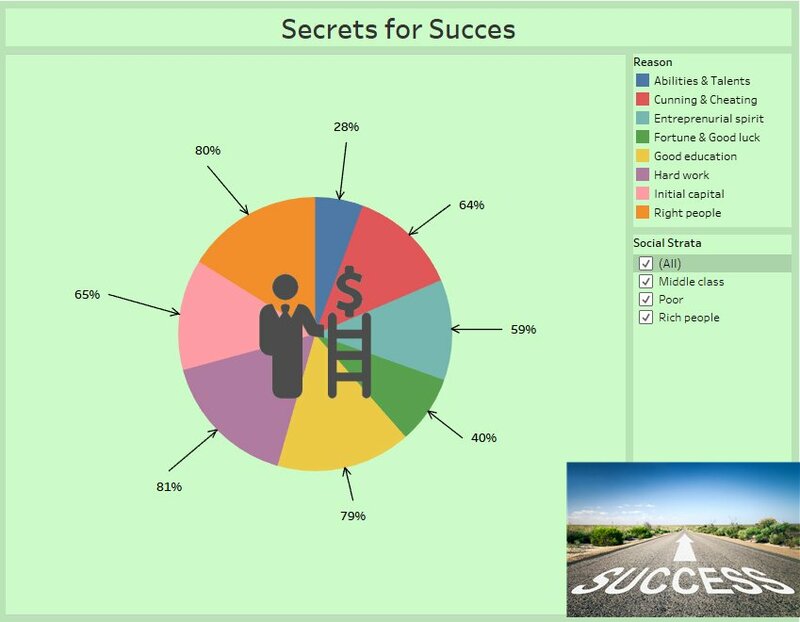 Week 13 took a look at an interesting survey from Russia about the secret of success that included a pretty offensive subtitle. 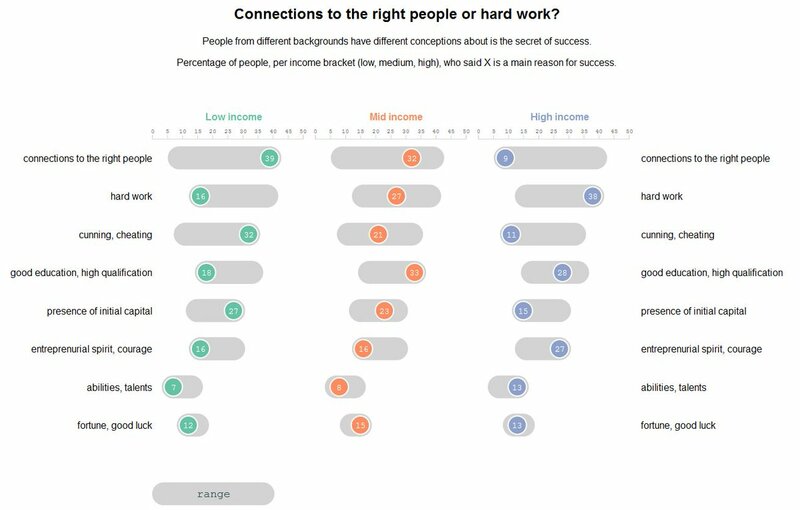 The data itself was pretty simple: 3 groups of people, 8 questions, 24 data points total. Incredibly the Makeover Monday Community has come up with 133 different versions of this simple data (as of this writing). I picked this chart intentionally as it’s one that we use in the first week of training at The Data School when we practice critically evaluating visualisations. One of the most interesting aspects of this chart is that it’s really, really hard to find anything out about the source. Given that, it’s really difficult to make definitive statements like the original made (and so many Makeover Monday visualisations mimicked). Every week while I review vizzes I take notes for these recap posts. This helps me organize my thoughts before I start writing. With that said, here are some lessons learned based on this week’s project. Sorry, this is a bit long. Too many people used the subtitle from the original and assumed it was fact. It’s written as a definitive statement. It’s not; it’s the opinion of the person who created the visualisation. We don’t have enough data to claim this as fact. When creating your titles and subtitles, think about how you can soften the tone when the facts are irrefutable. It’s shocking to me when people create pie charts, donut charts and stacked bar charts that don’t add up to 100%. This is such a fundamental error and, frankly, if someone is interviewing for a job with me and I see mistakes like this, they would never get the job. There are absolutely no exceptions to when the slices of a donut or pie chart shouldn’t add up to 100%. Stop doing this; it’s really, really bad. When you have multiple worksheets on a dashboard and you align them vertically and they all use the same metric, be sure they all have the same axis scale. Otherwise, when comparing the bars vertically, the data could be misinterpreted. As an example, Anna Reynolds created this overall simple, clean and good looking example, but notice the numbers on the bars as you read down. 27% is the same length as 38%. That’s not accurate obviously. This is an easy mistake to make when we work in a hurry like we tend to do on Makeover Monday. The lesson here is to keep this in mind going forward. You’ll see an example of this done well in my favorites list below. It’s sad that I even need to mention this, but don’t steal other people’s work and pass it off as your own. This past week someone literally downloaded this viz by Pooja Gandhi, changed the colors, then re-uploaded it as their own. That ain’t right! If you see someone doing this, call them out on it. I called the offender out publicly on Twitter, didn’t pin their submission and apparently she’s deleted her Twitter account. I’d think a simple apology and taking down the viz would be a better way for her to handle stealing Pooja’s work. Eva and I have been harping on about this constantly and the message isn’t sinking in. You cannot take the average of averages unless the sample size is the same. Period. End of story. Another simple analytical mistake that shouldn’t be made. Highlighting is an incredibly effective technique for storytelling with data. Used well, it accentuates the message while providing all of the necessary context. 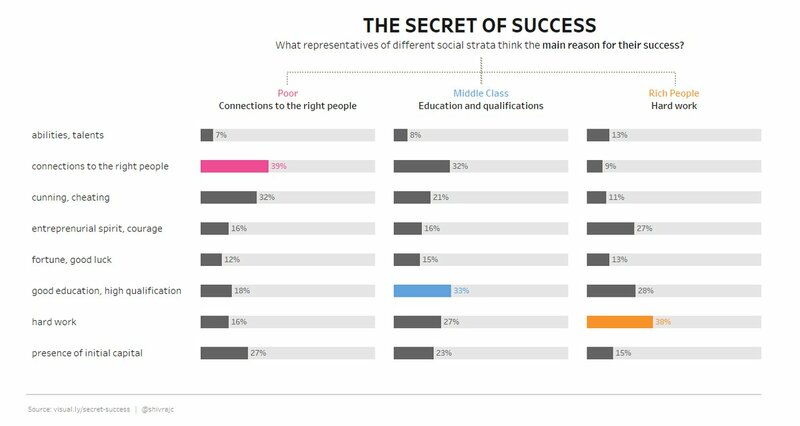 Divya Bharathi demonstrates this well in her viz by highlighting the largest bar within each social strata. This data set, given the ambiguity in the data, was perfect for keeping visualisation simple and many people did exactly that. In a great number of pieces this week, people stuck to simple visualisation that told the story clearly. In the end, data visualisation is a method of communicating and the simple you can communicate, the more likely someone is to understand the message. This dot plot from Natasha Kurakina is simple, beautiful and effective. Ok, that’s enough lessons for this week. I sure do hope you find these useful. Now, onto my favorites this week. I like the inclusion of the conclusion on the bottom right. This gives the whole viz a nice flow. The colors work really well for me and are easy to follow around the viz. How was this only her FIRST Makeover Monday?!? I love how Michael was inspired by David Krupp (another Makeover Monday participant) and used David’s work as inspiration. The dividers provide a really nice layout and section splits. The design forces me to read top to bottom and left to right in a story format. 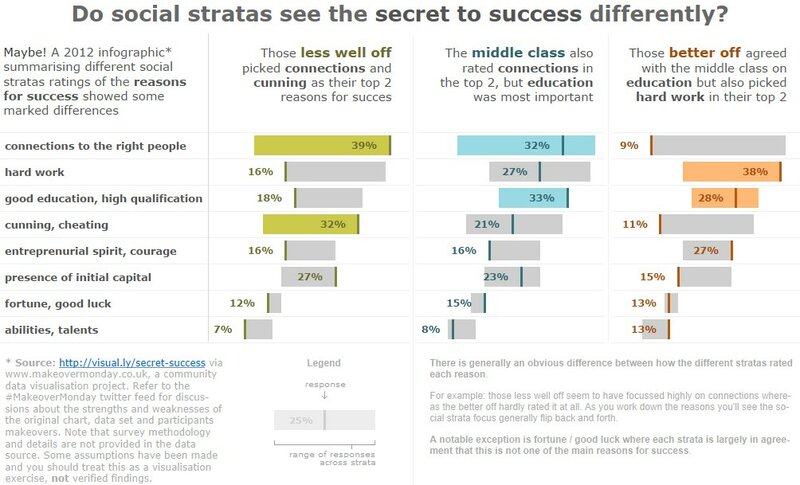 Including all social strata in each chart but only highlighting the group for that section helped spotlight each strata but kept all of the others in context. Overall simple yet beautiful. That’s really hard to do! Having researched the visualisation and its source I have found we can trace back the data used to a survey by the Russian FOM (Public Opinion Research Centre). Note that the survey has 1500 respondents. 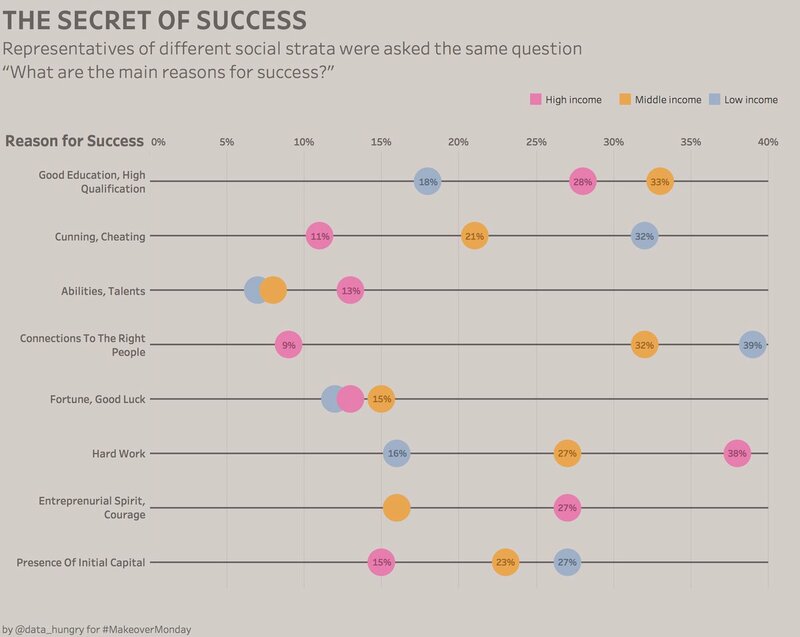 The “social class” was self reported, and that only 1% of the respondents identified themselves as rich i.e. only around 15 people. The original source visualisation for Makeover Monday made no such concession, a decision that is questionable at best and deliberately misleading at worst. 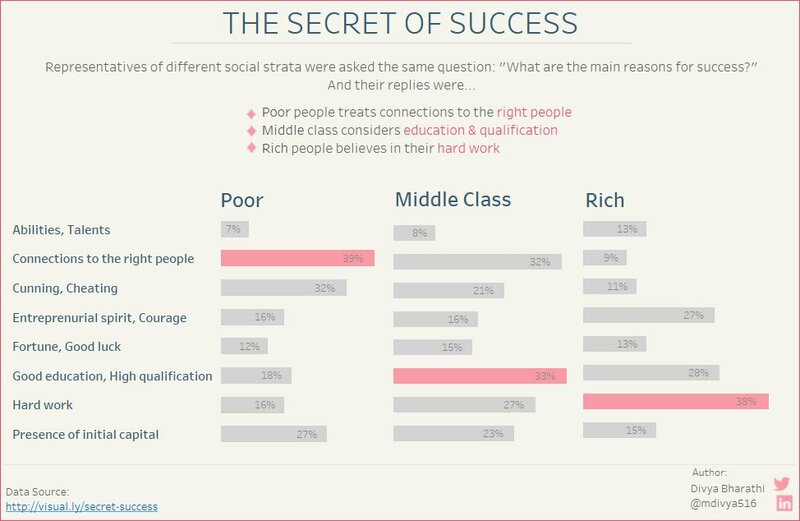 Neither does it point out that this is what Russian’s think about the Secrets of Success, a view which is likely to be very different to US / Western European viewpoints. Does this matter? Perhaps not, though this visualisation has been shared widely across social media and provoked a lot of debate I doubt the impact has been huge. The fact there are now 130 copies of the visualisation which repeat those mistakes is perhaps compounding the original problem although I don’t think we need to make a big deal of it given the, largely innocuous, subject matter. Makeover Monday does a great job of bringing issues with visualisation to light, we owe a great debt to Andy and Eva for the time and effort they put into it. I do hope as people learn to work with data they become as thoughtful about the source as they do about the resulting visualisations. At a time when “fake news” is in the spotlight it’s important we do everything we can to be critical about our sources of information and only repeat and share what we can demonstrate as credible information. Thanks for your contributions and research Chris!